Support the Humboldt County IHSS Workers Struggle for Fair Pay! If you know anyone who is an In-Home Supportive Services (IHSS) worker or a recipient who benefits from these vital services, you have probably heard about the struggle to win better wages and benefits for homecare workers. — These meetings are being hosted by the California United Homecare Workers (CUHW), the union that represents IHSS providers in Humboldt County. Our statewide President Gail Ennis will be available to answer questions, as will local members and organizers. This is an open invitation to all homecare workers, IHSS recipients, and anyone else who is interested in learning more. We’ll treat you to a cup of coffee or tea and chat about this important struggle. RSVP appreciated, but not required. Please respond to shaneb@cuhw.org. Meetings for the Eureka Fair Wage Act are every Tuesday at 6:15pm at the Eureka Labor Temple, 840 E Street (9th and E Streets). More information can be found and questions answered by visiting the Eureka Fair Wage Act website, fairwages.org, or by calling 707-442-7465. If you are interested in collecting signatures or helping the campaign in any way, wherever you live, please get in contact. All work for the Eureka Fair Wage Act is volunteer. 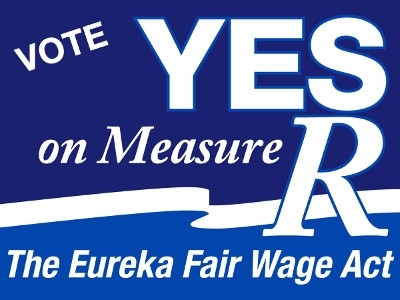 Eureka residents filed a peoples’ initiative this summer called the Eureka Fair Wage Act. If passed through a popular vote, the Eureka Fair Wage Act, also called the Minimum Wage Act, would require large employers with 25 or more workers in Eureka to pay a 12 dollar minimum wage. Eureka Fair Wage Act proponents assert that a higher minimum wage, with a small business exception, will improve lives, make Walmart reconsider its presence in Eureka, boost the local economy, bring employment up, and allow individuals who work full time to rise just above the federal poverty level. Fair Wage Act proponents are currently collecting signatures to get the initiative on the ballot and need your help. We Need 500 More Signatures! We need about 500 signatures now to start reversing the damage in Eureka. We need 10 people that can pledge 50 signatures, or 25 people who can pledge 20 signatures, or 50 people who can pledge 10 signatures. Or 100 people that can pledge 5 signatures! Signers must be registered to vote in Eureka. We Will Be @ the Co-Op Eureka This Afternoon – Come Sign For Fair Wages! Look for our table approx 4 pm til 6 pm this afternoon, and friday afternoon same times weather permitting. The Eureka Fair Wage Act campaign has just concluded its best week ever in signature gathering! We are now past the half way mark on our march towards ballot access. Despite an almost total local media blackout, the word of our movement for fair wages for the workers of Eureka is getting out. People are walking up to our tables and signing the initiative. It is not a done deal, we still have miles to go. We gained a couple of new volunteers this week but we can always use your help to help put us over the top in the second half of the struggle. Raising wages with a small business exemption forces big corporations to spend more of their profits here, through fairer pay for their workers. It is a win-win, good for the workers while providing a fresh cash infusion for the struggling local economy. Walmart and two staffing agencies in the Chicago area were named as defendants in a class action lawsuit filed Monday in Illinois. The suit alleges that Walmart, Labor Ready Midwest, and QPS Employment Group violated federal and state laws by denying workers legally mandated overtime pay and in some cases, paying them less than minimum wage for hours worked. The 20 initial plaintiffs in the case each worked for one of the two staffing agencies and were regularly placed at Walmart stores for temporary work, often stocking shelves in the stores. 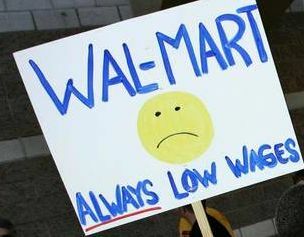 Walmart utilizes hundreds of such workers in the Chicago area alone, and plans to hire thousands more nationwide during the upcoming holiday season, according to a UFCW press release.